LAIKA’s issue 6 featuring Regina and Kat Von D, photographed by Melissa Schwartz. There was no question that Regina hen was destined to be a LAIKA cover star. 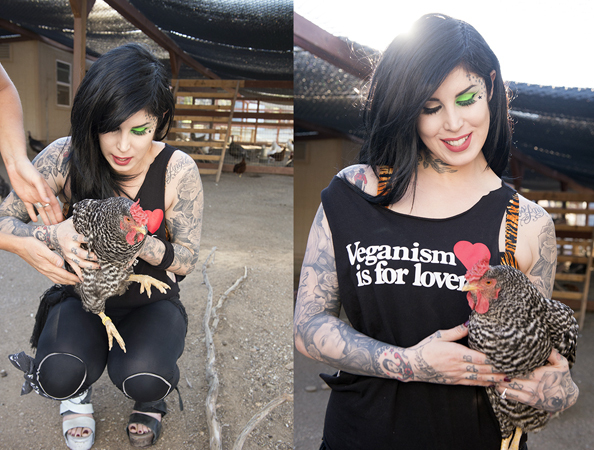 From the moment Kat Von D first held the cuddly chicken at our cover shoot, it was magic. Everyone on set at Farm Sanctuary in Acton, CA, where Regina resided, was smitten by the charming, curious, friendly and lovable girl. Not only did she fit right in during the shoot, she became the center of attention. Even her vibrant comb matched the color of Kat’s lipstick. 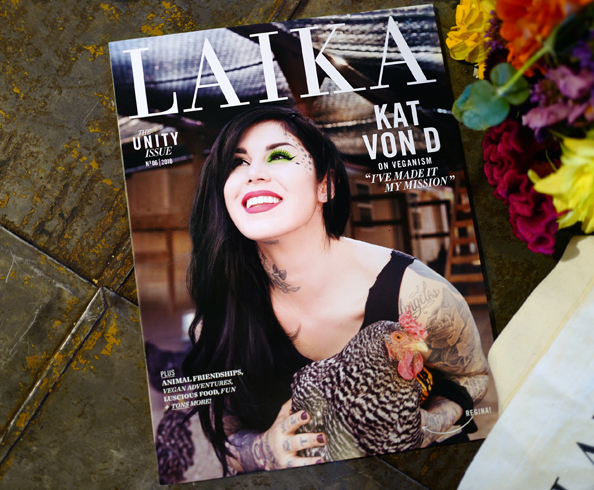 By sharing the cover of our vegan magazine with Kat, and with her name clearly printed, Regina was shown as an individual and a symbol of freedom for all animals. When Kat met Regina at our cover shoot—magic. Photos by Melissa Schwartz. But suddenly and sadly, Regina is no longer with us. Like so many hens, she suffered from reproductive issues and had a severely infected uterus. Although the surgery to remove it was successful, she passed away the night after it in late July. 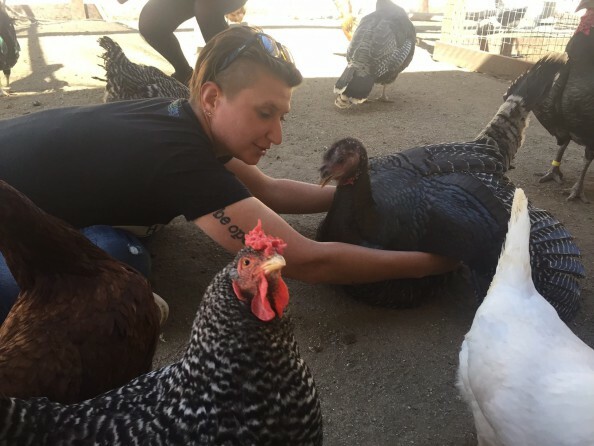 Regina was a rescue from a family’s backyard chicken flock – a setting that many believe to be more “humane” than the conditions faced by chickens on factory farms. In a letter to Regina’s loving sponsors, Farm Sanctuary explained that “whenever an animal is commodified, their individual needs and interests are overlooked in favor of securing profits.” Chickens who are used for eggs frequently develop reproductive issues due to overproduction. It’s unimaginable for Regina to experience cruelty, yet the U.S. alone kills 23 million chickens every single day. In fact, they are the most abused land animal on the planet. But if given a chance to express themselves, each one will show a personality that is uniquely their own, just like Regina’s. Regina in the foreground during our shoot, curiously examining the camera, with Danielle behind her. She made an excellent ambassador for her species. Regina, whose light shone bright, will live on forever on the cover of LAIKA, reminding that chickens are individuals whose lives matter. In honor of her memory, and all animals, we encourage you to go vegan.